Lace up your sneakers! Running through a series of silly obstacle courses may not be for everyone, but there’s no denying that 5ks have increasingly become more fun than running several laps around a track. Crossing your first real finish line is a thrill that’s hard to beat. But if you’re new to fitness, it can be really intimidating to sign up for a race, even if it’s just a “fun run”. Don’t worry about those initial fears. Just follow these tips and take it one stride at a time. Before you sign up for a race, make sure you get medical clearance from your health care provider. If you’ve never ran or walked long distances for exercise, it’s best to start training gradually. Your doctor can help choose a level of intensity that suits you. Shoes, shoes, shoes! Choosing the right shoe is one of the most important things you need before hitting the pavement. If you live near a specialty running shoe store, that’s a great place to start. Talk with an expert about your goals and they can help match you with the best pair of running shoes for you. Form is key. 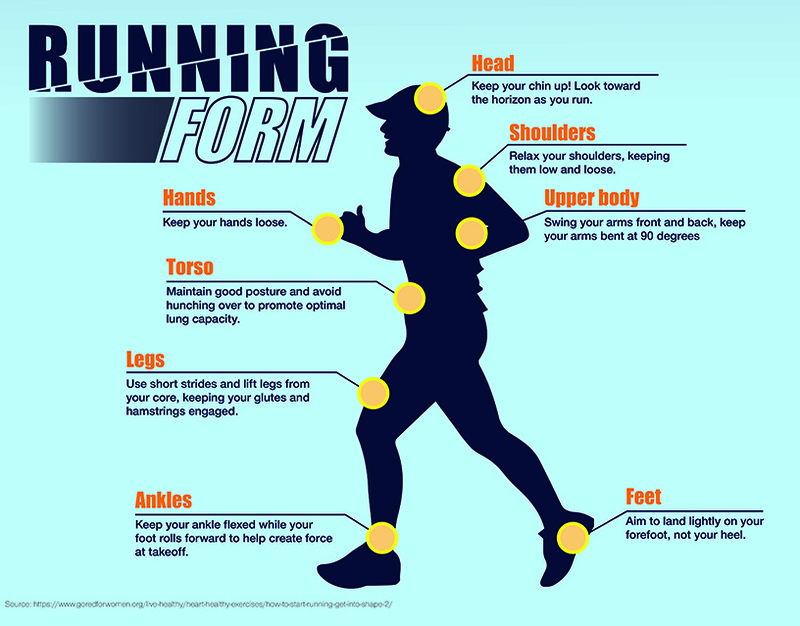 Take a look at this infographic below to make sure you’re using the correct posture while running. No one knows you like you do. Start slowly and take it easy on yourself. Take a fifteen minute walk four times per week. From there, you can extend your distance until you can go for three miles. Then, try mixing in some light jogging if you can. Many people enjoy walking the entire 5k, and that’s great too. Find a few walking buddies and simply enjoy being active together. As always, remember to consult your doctor before starting any new exercise program. See you at the finish line!